Seattle boasts the biggest film festival in the United States, in terms of both audiences and films shown. But Seattle filmgoers are also lucky enough to be within easy driving distance to the Vancouver International Film Festival, one of the five biggest festivals in North America. Coming on the heels of Toronto, it boasts a sampling of highlights from Toronto and Venice as well as a spotlight on Canadian cinema, an annual spotlight on French Cinema and the Dragons and Tigers series, one of the best collections of new Asian cinema in North America with a special focus on young talents and new filmmakers. Thirty features and documentaries were screened in the “Dragons and Tigers” sidebar, with eight of those films in competition for the “Award for Young Cinema.” The competition can be a mixed bag, but it almost always offers promising talent and fresh filmmaking ideas that otherwise would be unseen on North American screens and it’s my priority every fest. Most of the films are scheduled for the first week, which due to unusual conflicts (yes, there are some things more important than movies) I missed this year. But I did catch up on a few re-screenings including the winner of the Dragons and Tigers competition. Eighteen, a quasi-autobiographical drama from first time filmmaker Jang Kun-aje, it’s a largely low-key study in the impulsive, illogical self-absorbed nature of being age eighteen, when they are no longer children but certainly not adults. Add to this teen romance in the throes of hormonal overload and reflexive rebellion and the specific freedoms and restrictions of high school kids in South Korea, where the usual pressures are compounded by the emphasis on scholarship and grades (it means everything in the highly competitive struggle to land a good college) and you’ve got a universal story from a unique cultural perspective. Tae-Hoon is headstrong, defiant, rebellious, sloughing off school, caught up in the emotional rush of romance so much he doesn’t take responsibility for anything, especially when he sweeps his high school girlfriend Mi-Jeong away for a week at the beach without so much as a phone call to either of their parents. When it comes time to face up to the parents, neither are prepared for the runaway fury of Mi-Jeong’s father, whose chummy hospitality at a family summit escalates into interrogation, confrontation and intimidation, driven in equal parts by protectiveness, paternal territoriality and whisky. The film never matches the tension and dramatic dynamism of this slow burn to explosiveness and the story takes a familiar, if not always expected, path. Where Jang’s film really shines is the way it captures the blinkered state of the age. Tae-Hoon’s surliness is maintained until he faces Mi-Jeong’s father, and then his defiance is largely in slinking around the pledge he signed to not see Mi-Jeong until after graduation. Meanwhile the anxiety of it all makes Mi-Jeong just shut herself off to everythingâ€”including Tae-Hoonâ€”much to the boy’s frustration. And of course, frustration only leads to more gestures of defiance and almost inevitable disasters. My Daughter, another first feature, is a near-minimalist portrait in emotional distance and disconnection between a single mother in an abusive affair with a married man and her exasperated daughter, who is appalled at the emotional and physical battery her mother is putting herself through and tired of the gossip the affair inflames in the local community. The Malaysian drama from Charlotte Lim Kay Kuen is pretty much a two-hander with characters who rarely share the same frame, and it cuts the heart of the emotional temperature, the daughter’s anger at her mother and the mother’s furtiveness and stubborn defiance as she keeps returning to him, like an alcoholic sneaking out to a bar. Lim has stripped the film down to its essence and, even more than in “Eighteen,” she reveals a powerful talent trying out expressive ideas. She has great stylistic control and but less technical command, and her a confusingly juggled timeline offers a visual rhythm in place of a narrative logic. While neither film seems quite fully realized, these two World Premieres of debut features offer exactly what the Dragons and Tigers competition strives for: the discovery and presentation of young filmmakers and formative talent. I look forward to seeing more from each of these filmmakers. I was only able to see a few of the films either in or out of the competition, but of those I did see, I was most taken with Bare Essence of Life from Japan and Breathless from South Korea (my first screening at VIFF this year). Bare Essence of Life (or “Ultra-Miracle Love Story,” which is apparently the literal translation of the Japanese title) is a flawed but engaging and energetic comic drama that begins as a character study of a farming village oddball, a goofy childman whose “brain works different from other people’s” (“Not broken, just different”) and turns into an oddball film that, in its own funky way, ventures into zombie movie territory via a screwball romance and a tragicomic experiment in pesticide showers. Yojin (Matsuyama Kenichi) is a ball of unfocused nervous energy, hyperactive and fidgety, an undisciplined child in a man’s body whose response to frustration is usually destruction and flight, laughing all the way. His impulsiveness and inability to see the discomfort and frustration of others scares off substitute teacher Machiko and comes close to alienating the audience, but Matsuyama invests himself completely into this character and his extreme attempt at chemical solution to calming his spastic brain. Writer/director Yokohama Satoko is equally committed to the eccentricities of her earnest child-man and that strangeness radiates out to the unusual details on the periphery of his story. 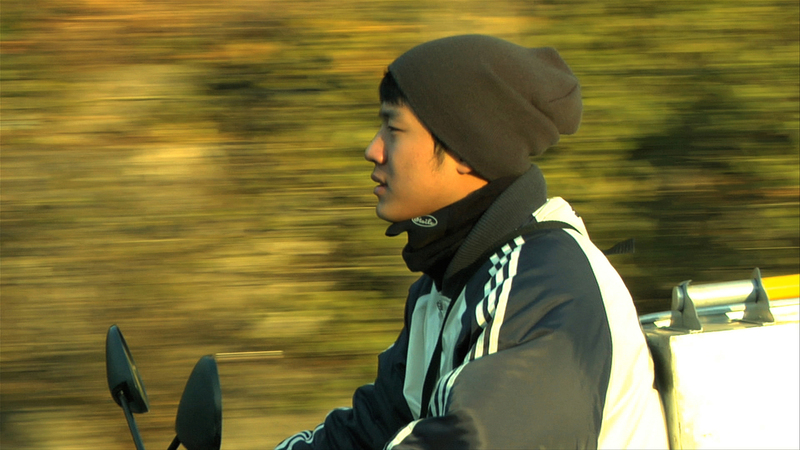 Title aside, Yang Ik-June’s Breathless has nothing to do with Jean-Luc Godard’s New Wave masterpiece. It’s hero, Sang-hoon (Yang Ik-June), is a brooding debt collector and thug for hire who beats up his own co-workers almost as often as he does his assigned victims. His attempts to bond with his fatherless nephew are as misguided as anything he doesâ€”the kid is almost paralyzed between his eagerness for such paternal attention and complete intimidation by this gruff loveâ€”and a thoughtless gob on a passing schoolgirl (it’s not a malicious insult; he just doesn’t care) reveals a teenage girl who as just as insolent and aggressively in his face (or rather his Adam’s apple; she’s a pixie compared to this bruiser), at least in his presence. The rest of the time she’s a victim of a seriously damaged family. And that’s pretty much what Breathless is about: the son of an abusive father whose violence left him all but an orphan turned into a self-made bully, trying to construct a makeshift family around him but too scared to make an emotional connection in any direct way. Which is what makes the film so watchable. Sang-hoon isn’t callous, he’s pathologically defensive, working to drive people away emotionally before they have a chance to get a hold on his affections, yet so needy he keeps returning just to be in their presence. But there is also an uneasy undercurrent of violence and predation as a way of life that destroys others. There’s plenty of redemption here, but this life also spawns the next generation of Sang-hoon. One film that did not impress in any way is Kamui, a Japanese ninja adventure ballyhooed by programmer Tony Rayns in the program notes as: “probably the best ninja movie ever made.” I understand that catalogue write-ups are often over lavish in their praise, but Kamui, adapted from a sprawling manga epic by director Sai Yoichi, is dull, uninvolving and completely mundane, an utterly conventional and stylistically unimpressive parade of set pieces with distracting CGI and empty action spectacle. It plays like a series of narrative highlights from a story I was expected to be familiar with and I only watched half of the film before growing tired of the confused plotting and indifferent character development.